It is a lot of work to carry long lenses when flying. My 600 and 200-400 lens stay home a lot. I have been in Wyoming since Tuesday. Tuesday until this morning in bed…..or kneeling in the bathroom. Sorry too much information. Feel a lot better today. My regret today is that I wish I had brought my long lens on this trip. The photograph above was taken from the roadside. 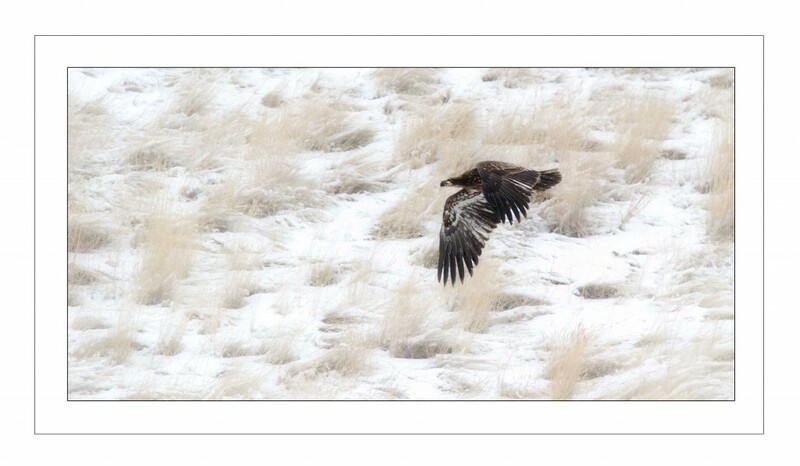 The Golden Eagle was dining on a dead deer on the shoulder of the road. And Bald Eagles were waiting in the wings. Golden Eagles are dominant over Bald Eagles. I missed an opportunity to get a great shot of a Golden Eagle. Not to many shots of Goldens in my portfolio….in fact just a couple. This shot was taken with a 70-200. Tonight I had dinner with Erika and her mother. Wonderful people. Good friends. Erika is now and will someday be a queen. “Rodeo Queen” to be exact. Though not technically a rodeo queen now…in my book she is royalty. She reminds me of my daughter that just married. Good people, good conversation and great food. Hope to see again before too long.